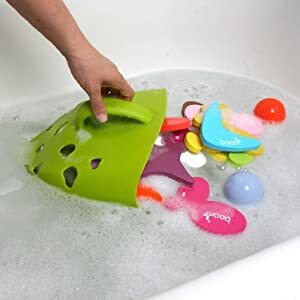 This is a new and innovative way to store and organize bath toys in your bathtub, which I actually learned about from a tip from a reader to the site. I am always looking for new ways to store bath toys, because I know it has been a real problem in my own home, and many other people have shared this same issue with me. This, by far, looks like the best option I've found so far to deal with the issue -- especially the mildew and mold problems that many of these storage solutions pose. 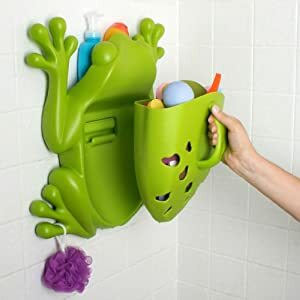 Basically, this is a huge frog that hangs on the wall, inside the bathtub, to hold toys. Some people are surprised by its large size, but it is pretty big so definitely look at the dimensions before purchasing it. Of course, many people love the large size because it can actually fit a lot of bath toys in it that way. You can mount the Boon Frog Pod on the wall in one of three ways, adhesive, suction cups or screws. Many people have used the adhesive and have had great success with it, but it makes it a pretty permanent accessory in your bathroom. (Of course, so do the screws.) The suction cups seem to work well too, but it is more likely to fall with this method, since it is heavy itself and then especially loaded with toys. The frog is made of hard plastic which is mildew resistant, which is a big plus in my book. You still want to rinse off your bath toys before hanging it back up, but it does drain at the bottom which is also a big plus. 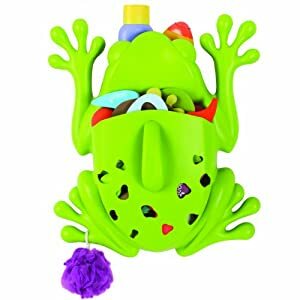 A nice bonus feature is that you can hold shampoo or other supplies in the back of the holder, and hang poofs and other toys on the froggy's toes. At first I could not really picture how this product worked, but these pictures really helped me understand the scoop, so I'm sharing them with you, because I think they'll help you understand too. If you've used this bath organizer and storage system yourself, I would love for you to share how it has worked for you in the comments. I was amazed at how many positive reviews of the product there were on Amazon already! I really like ours. The only problem was the adhesive tape did not hold up. I called Boon and they sent some suction cups. I don't have a problem with it falling now. Just make sure you wet the suction cups a little before you hang them. We have one, and I love it in theory, but we have a hard time getting the suction cups to stay stuck. It comes with double sided tape also, but that didn't hold well either. Maybe our toys are just too heavy. But the scoop is very useful. Be sure you know where you want it . . . I had one and loved it! However, be certain of where you want it prior to putting the adhesive tabs down, because once they make contact they won't budge. Ever. Until the end of time. We have one, and we also have problems with the suction cups. It has fallen off the wall of our shower so many times. Not fun for that to happen when you have a sleeping baby in the next room! Otherwise, we love it. I have the ladybug version and it came with adhesive tape - it's been stuck on the shower wall for 2.5 years and hasn't budged! Love it! Great storage that's cute and doesn't get mildewy! Bad thing about it is if you move or want to take it off it doesn't come off! I tried everything to get it off our shower wall and it wasn't budging. I'll try the suction cups next . . .
We have the ladybug. It fell off with the adhesive too. I'll try calling for the suction cups. We like it but for it to be useful it needs to be on the wall. We have the lady bug too. We used the adhesive to hang it. It was there for a year before we moved and never had problems with it falling. You should have seen the work required to get it off the wall...muscle, razors, and goo-be-gone! 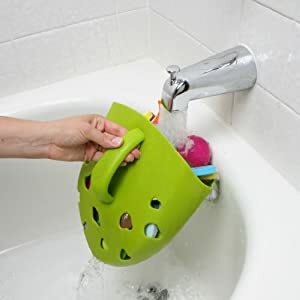 Great for keeping bath toys under control; if it doesn't fit, something has to go.